Reform Judaism mourns Della Carr z”l who died on Friday 11 January. 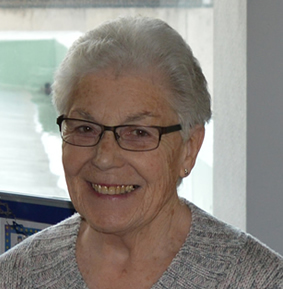 Della was most recently chair of Southend and District Reform Synagogue and previously served as Chair of SWESRS (South West Essex and Settlement Reform Synagogue) and as Chair of Reform Judaism’s Board of Trustees. In the words of David Jacobs, Reform Judaism’s former Director for Synagogue Partnership, who spoke at a special service honouring Della in Southend last August, she was: “one of the Reform Movement’s most dedicated women whom I have had the privilege of knowing and working with for more than 30 years… a Reform Movement person; a member of the Reform Movement family”. Della made a significant contribution to the development of Reform Judaism in this country, both as a professional member of staff and as a lay leader for over 40 years. Della and her late husband Les joined Alyth following the birth of their children Jackie and Phil before moving east and joining SWESRS where Della became Chair in 1988, serving that community with distinction for three years and presiding over the beginning of construction of their new synagogue building. They later moved to Southend to be closer to Jackie, becoming involved in the Reform community there and it wasn’t long before Della was asked to become Chair, joining a very select group of people to have chaired two different synagogues. Della worked as administrator and financial controller of the Movement and later chaired the Reform Movement’s Board of Trustees with skill and diplomacy. David Jacobs said: “Visiting communities around the country to help resolve some of the challenges they faced, it was always a pleasure working with Della. Her listening skills shone through in these often tangled and complex situations and she was always diplomatic and unbiased in her advice”. Della was instrumental in the creation of the Ahada bereavement support group which helps people who are grieving the loss of a loved one in Redbridge and Essex and served as a governor of JJBS – the Jewish Joint Burial Society. She was also actively involved in Pro-Zion’s work to support Progressive Judaism in Israel and to promote Israel in Progressive Jewish communities in the UK. Our condolences go to Della’s children, Jackie and Phil, and all in our community who mourn her death. May her memory be a blessing.